Gov. Rosselló, flanked by Puerto Rico mayors, offers details of the newly established Recovery Fund. Following the back-to-back strikes by Hurricanes Irma and María, Puerto Rico’s municipal governments, for the most part, represented the first line of response to the emergency, prompting the central government to unveil a $100 million fund to support their work. On Thursday, Gov. Ricardo Rosselló launched the municipal Recovery Fund, to help municipal governments and mitigate the impact to the decline in revenues and an increase in emergency spending. The Fiscal Agency and Financial Advisory Authority, or AAFAF, is assisting municipalities as fiscal agent and will evaluate emergency work, while the Treasury Department will disburse the money. Municipalities may apply for these funds with objective criteria such as the decrease in extraordinary income and expenses by the emergency. 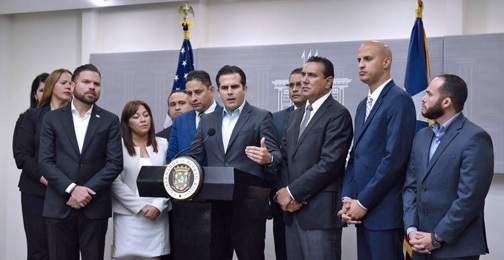 Members of the Mayor’s Association and the Mayor’s Federation flanked Rosselló as he made the announcement following a meeting at La Fortaleza. “The important thing is that this Recovery Fund will have a clear mechanism to approve the disbursement of funds,” said Rosselló. “The evaluation of emergency work and the income gap or real revenue collections by the municipality will be conducted by AAFAF, as fiscal agent. The Financial Oversight and Management Board for Puerto Rico must review approved legislation [to regulate the use of the funds], as per section 204(a) of the Puerto Rico Oversight, Management and Economic Stability Act,” Rosselló said. The intention of the measure is to direct funds to municipalities in times of crisis. “This money will allow municipalities to continue helping in the recovery after the devastation of the hurricanes, so they can cover their payroll, and pay for goods and services,” said the governor. Hey Buddy!, I found this information for you: "Rosselló unveils 0M municipal Recovery Fund". Here is the website link: https://newsismybusiness.com/rossello-municipal-recovery/. Thank you.